The wife of U.S. Representative Gene Green (D-Texas 29th District) is recovering after a bizarre accident at his campaign office last week resulted in the loss of her left eye. Helen Green, 62, was moving some of her husband’s political signs around at his campaign office in the Greenspoint area when a large sign fell on her. Mrs. Green was taken to Memorial Hermann Hospital where doctors operated on her left eye three times over a period of several days. It was during surgery last Friday when the medical experts determined they could not repair the extensive damage and removed Mrs. Green’s badly damaged left eye. She is now recuperating at home. Congressman Green said his wife of forty years will travel with him as he returns to Washington later this week to resume his congressional duties. Mrs. Green will be treated by doctors in the Washington D.C. area. We spoke briefly and I didn’t have a chance to ask him if his wife plans to get a prosthetic eye. I wish her the best during her recovery. 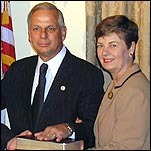 Congressman Gene Green was first elected to Congress from the 29th Congressional District of Texas in 1992. He is up for re-election in November 2010.